Today, I would like to sing the praises of tiny teff. And tiny it is. Similar in size to poppy seeds, teff is the smallest grain on the planet. No surprise the name refers to “lost” in Amharic, the official language of Ethiopia. Yet, the miniscule grain is a nutritional powerhouse. 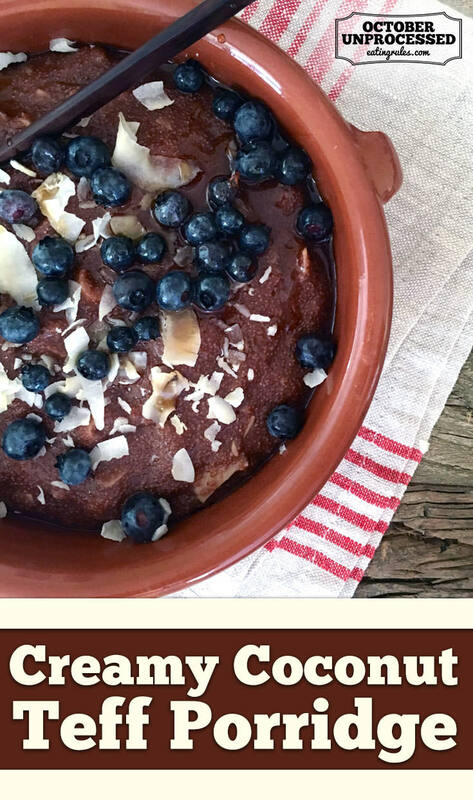 Gluten-free and fiber-rich, teff’s calcium content is superior to all other grains. It is also high in so-called resistant starch, a type of dietary fiber beneficial to gut health, weight control, and blood sugar management (Source: Whole Grains Council, to which I serve as a Culinary Advisor). But best of all, teff’s aroma is mesmerizing. It has a subtle sweet intensity with notes of cocoa and caramel. 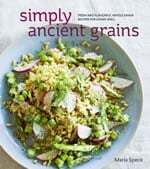 No wonder, the little ancient whole grain is fast becoming a darling of chefs and food lovers alike. This flavor profile inspired my recipe for Overnight Waffles with Teff, Coriander, and Caramelized Pineapples in Simply Ancient Grains. The dark variety of teff has become more widely available in the US. Lighter varieties of teff, part of the lovegrass genus (Eragrostis), have a milder aroma. American farmers have even started to grow the grain in Idaho and Kansas so you can expect to see more of it in markets soon. 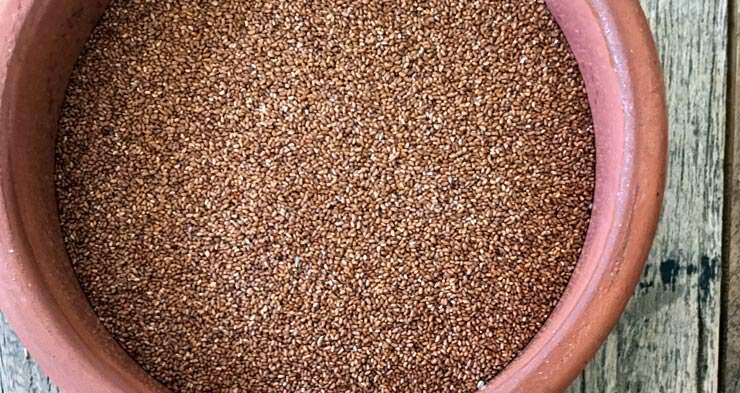 Cultivated in Ethiopia and Eritrea for at least three thousand years, probably longer, teff is best known for its use in naturally fermented injera flatbread, a staple in Ethiopian cuisine. The big round flatbread is placed on a platter for all to share, topped with mounds of vegetables, legumes, meat, or fish. Eaters tear off a piece and use it as a spoon, mopping up the highly flavorful sauces with the bread. Traditionally, spongy injera is naturally fermented and made only from ground gluten-free teff—hence its sourness. In US-restaurants, however, the flatbread is often made with the addition of all-purpose flour. More recently, some have gone back to tradition and offer gluten-free all-teff flatbread. 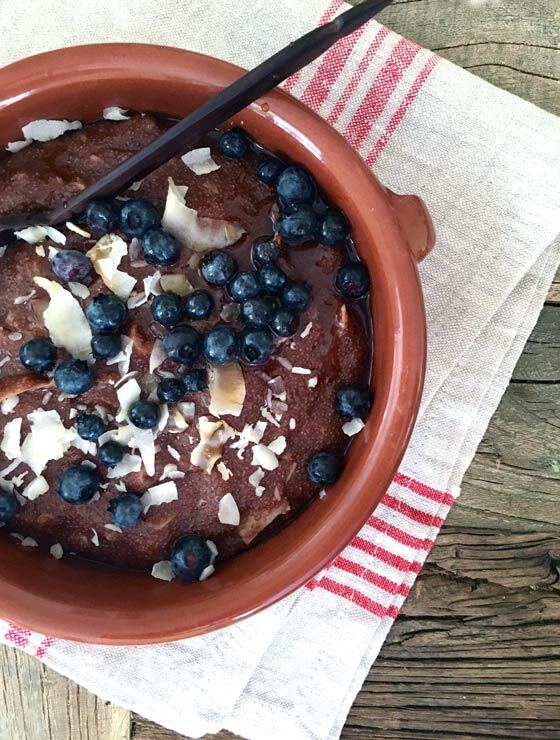 Teff is a great quick-cooking grain. As a porridge or “polenta,” it cooks up creamy with a light delicate crunch which makes it highly adaptable for breakfast, lunch, and dinner, even for dessert. It cooks in about 15 minutes, perfect for busy weeknights. Use 1 cup grains to 3 cups water and follow the general instructions in the recipe below. Never rinse teff in a sieve as you might end up losing the seeds with the water. Teff’s characteristic sweetness makes it a natural for breakfast recipes, as in the Creamy Coconut Teff below I created for October Unprocessed. In savory dishes, the tiny grains contribute an intriguing meatiness, thus pairing beautifully with dark leafy green vegetables, fish, and meat alike. I like the descriptor “teff polenta” because the porridge brings the same soul-warming creaminess to the table like its Italian sibling made from cornmeal. Similarly to polenta, leftovers stiffen and firm up fast after cooking. This is no reason for despair. Instead, consider it a bonus with new options for lunch or dinner the next day (see Fine Points). So be sure to always make more teff than you need. Teff’s characteristic sweetness makes it a natural for this breakfast porridge, and I love using coconut chips for the added texture. Bob’s Red Mill sent me teff to use in developing this recipe. Add the water, teff, coconut, cocoa, 1 tablespoon of the maple syrup, and the salt to a large heavy saucepan, whisking to combine and bring to a boil. Decrease the heat to maintain a simmer, cover, and cook until the liquid is absorbed and the grains are tender, 15 to 20 minutes. You have to stir a few times with a wooden spoon, vigorously and scraping the bottom, especially after 8 minutes or so, because teff has a tendency to become sticky. Any lumps will dissolve with good stirring. If the pan runs dry, just add a few tablespoons of water and stir well. To finish, stir in the butter and the remaining tablespoon maple syrup. Divide between 4 to 6 serving bowls. Sprinkle with fresh berries and more coconut chips if you like. Serve warm, passing maple syrup at the table. I like adding any remaining teff polenta to a lightly oiled 9 x 4-inch loaf pan. Allow to cool, cover with plastic wrap, and chill until firm, at least 2 hours. Loosen all around, with a thin-bladed knife; carefully turn over and invert the firm loaf onto a cutting board. Cut into slices, then further into triangles, or “fingers” and fry, preferably in unsalted butter. Full disclosure: Bob’s Red Mill sent me teff for recipe testing. I love using coconut chips for the added texture.